Good reviews have huge benefits for local businesses. The improve your traffic and conversions while boosting your reputation (which improves traffic and conversions again). 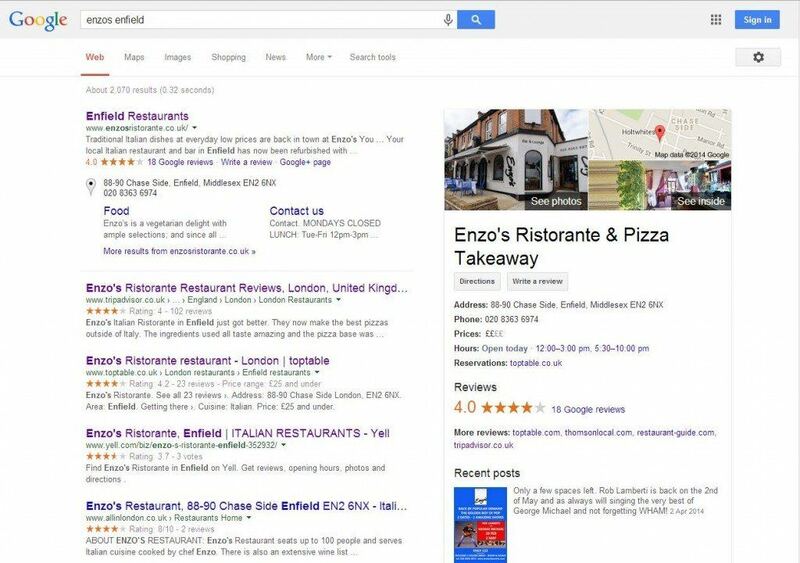 You can even increase the number of business listings on the first page of Google since your review profiles will be featured as well as your own site. It’s extremely easy for these sites to work out if you’re using any of these tactics. For example, if all of your reviews come from the same IP address you could be banned or even fined for faking your own business reviews. If they all come in a sudden cluster, the sites will also work out that you’re doing something to attract reviews so they’ll bury them. But that doesn’t mean there’s nothing you can do. It simply means that the changes you need to make are bigger than simply offering a prize draw. This is really the main part for all reviews – happy customers leave good reviews. So the best way to encourage them to do so is to really go the extra mile, make sure that your service/products are excellent and resolve any issues as enthusiastically as possible. 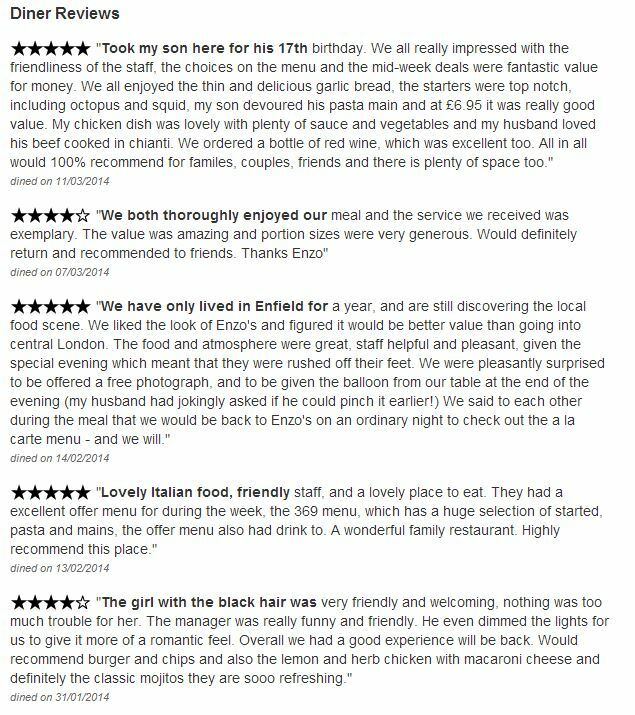 Enzo’s Restaurant in Enfield has great reviews across a range of sites including Tripadvisor and TopTable, which are huge influencers in their industry. When you look at the reviews, they’re varied, sincere, and haven’t all been added to the site in one go (so they’re genuinely earned). While the reviews may be encouraged a little, they’re clearly the result of excellent service, good food, and attentive staff rather than a promotion. What local business wouldn’t want comments and search results like this? Another way to ensure that your customers leave reviews for you is to stay in touch with them. If a customer never hears from you and never engages online, they’re unlikely to make the effort to write a review or even think of your business while they’re in the position to leave a comment about your staff or service. There are plenty of times when you can engage with customers without explicitly asking for a review. Keeping in touch helps you upsell, gain repeat business, and improves your customer retention so it has benefits that span much further than simply improving your search results. You can email customers with reminders (if they have appointments), email with confirmations of orders, send them thank yous or surveys to improve your service further, or just send regular newsletters or promotions to maintain contact. Any of these emails can contain links to your social media profiles or profiles on review sites – these links aren’t the main reason for the email but do offer the opportunity to click and leave a review. This is really the simplest and most active step you can take to encourage reviews: create a profile for them. Setting up profiles on these sites can give your site a small boost, but it mainly provides a place for customers to leave reviews for you. If you’re not already on these sites, it just makes it that much harder to leave a review for you.